Following the bass that took while my plug was tangled in weed and the obvious wealth of sandeels present (indicated by the sandwich tern activity) I thought that the spot merited another go. A couple of days later I was down there again at three-thirty in the morning. This time it was absolute low water. There was no movement on the tide race and although it was pretty dark, the kelp fronds were standing proud of the sea surface. There was so much kelp (it's different every year) that it was obviously going to restrict where I could fish. There was one patch of open water to the east of my stance, about ten metres square. To the west there was a long narrow gully parallel to the rocks. I tied on a good sized surface popper to avoid the worst of the snags and for ten minutes I alternated casts between the two fishable areas. I noticed that the tide was already beginning to creep towards my booted feet and thought to myself that I would have to be wary about being cut off. Another ten minutes and most of the kelp was underwater so I began to spread the casts over a bigger aresa. The popper worked wonderfully. By now the race was rushing over the ledge from right to left so I chucked my popper just upcurrent of the turbulence and began to retrieve. 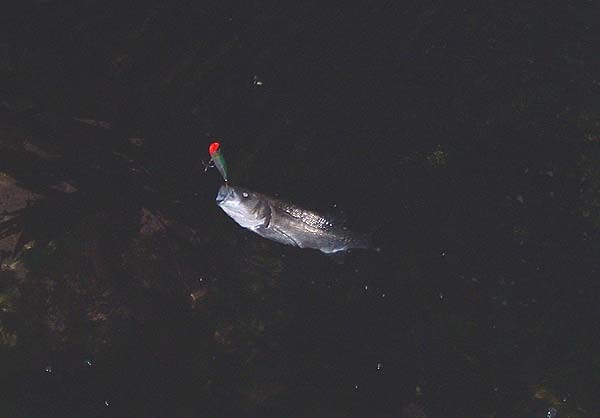 I felt a pluck out there in the dim light and although I could not see it I knew it had been a fish. I cast in the same direction again and chugged the lure back. I was just about to lift it from the water a bass launched itself into the air with my lure in its mouth. The fish fought hard in the strong flow and it was a little while before it was under sufficient control for me to grab the camera. I managed a couple of pictures before I returned it and then noticed that the tide was just about to top the rock that I used as my 'clock' for 'time to go'. I grabbed the bag, and the fly rod (unused) and began to wade back. The rocks under my feet were very slippy and round. The water was about a metre deep. I felt myself toppling and it was only by performing an elegant pirouette that I managed to avoid a complete ducking for me, rods, reels and (worst of all) bag and cameras. I made a mental note to be more careful next time. 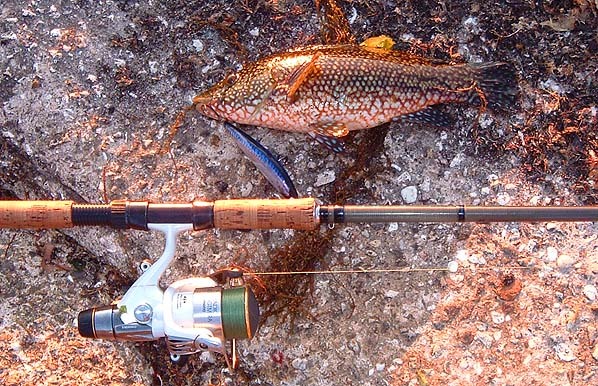 I changed my lure to a shallow diving plug and walked back along the shore casting into likely spots. Just beside an old wooden groyne the lure was taken and the fish, although it pulled hard, never showed at the surface. "Wrasse!" I thought. 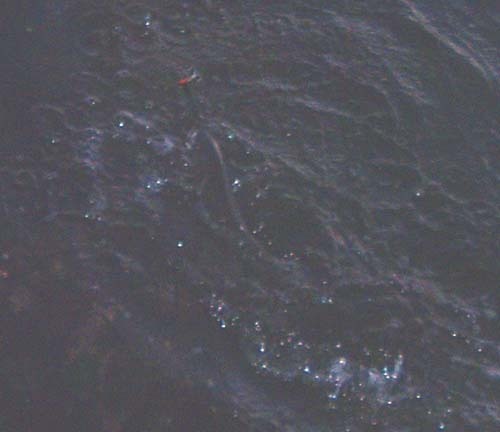 Sure enough, after a bit of a tug-of-war, the brown flapping body of a ballan soon came to the shore. Encouraged I walked on and had a few casts from a small shingle beach. 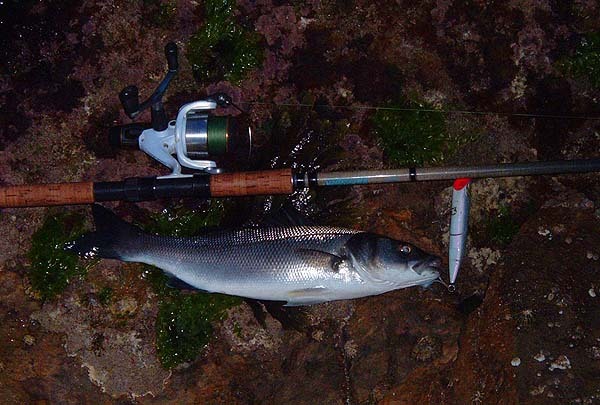 A bass of about 1kg took the plug and I landed and released it without bothering to take a picture. A good hour-and-a-half's fishing. The sun was shining - what a lovely morning!